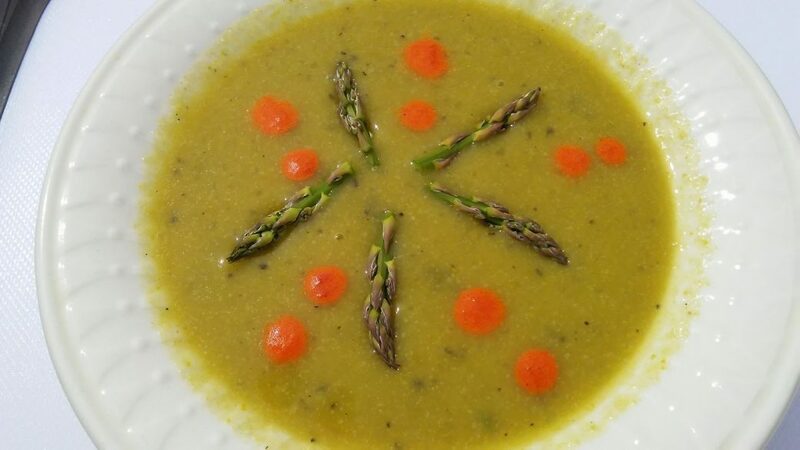 Green cauliflower & asparagus soup with roasted red pepper & garlic puree. This super creamy comfort food soup is great hot on a cold day or served cold on a hot day. Add the sage, nutritional yeast, and garlic to the veg broth and bring to a rolling boil. While the broth is coming to a boil, cut the cauliflower into small pieces. Hold each end of an asparagus stalk and bend till it breaks. This will mark where to cut each end off. (I reserve the fibrous ends for making a stock with. For this recipe save or discard them) Cut off the tips of each asparagus stalk about 1″ long and set aside. These will be added at the very end as they cook quickly and will add flavorful texture. Cut the rest into 1″ pieces. Boil for about 15 minutes until the cauliflower is fork tender. Using an emersion blender, blend until thick. Blending less with make for a chunkier soup. Separately as a tasty option, blend roasted red peppers and 1 garlic clove together with a few splashes of the liquid from the roasted red pepper jar. Drizzle over each dish as it’s plated.